This discussion will identify the huge expansion of genomic technology in the search for biopharmacotherapeutic targets that continue to be explored involving different levels and interacting signaling pathways. 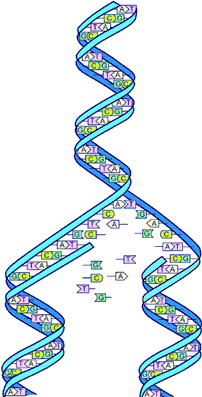 There are several methods of analyzing gene expression that will be discussed. Great primary emphasis required investigation of combinations of mutations expressed in different cancer types. James Watson has proposed a major hypothesis that expresses the need to focus on “central” “driver mutations” that correspond with the regulation of gene expression, cell proliferation, and cell metabolism eith a critical rejection of antioxiant benefits. What hasn’t been know is why drug resistance develops and whether the cellular migration and aerobic glycolysis can be redirected after cell metastasis occurs. I attempt to bring out the complexities of current efforts. are following a pathway that is not driven by attacking the “primary” driver of carcinogenesis. He uses the Myc gene as an example, as noted in the previous discussion. The problem may be more complicated than he envisions. switching to another drug, or combination chemotherapy. It is common to “clean” the field at the time of resection using radiotherapy before chemotherapy. But the goal is understood to be “palliation”, not cure. whether there is a core locus of genetic regulation that is common to carcinogenesis irrespective of tissue metabolic expression. This is supported by the observation that tissue specific express is lost in cancer cells by de-differentiation. In 1967 Otto Warburg published his view in a paper “The prime cause and prevention of cancer”. This thinking came out of decades of work in the Dahlem Institute Kaiser Wilhelm pre WWII and Max Planck Institute after WWII, supported by the Rockefeller Foundation. The oxygen- and hydrogen-transferring enzymes were discovered and isolated. The methods were elegant for that time, using a manometer that improved on the method used by Haldane, that did not allow the leakage of O2 or CO2. The interest was initiated by the increased growth of Sea Urchin eggs after fertization, which turned out to be not comparable to the rapid growth of cancer cells. that the normal tissue did not accumulate lactic acid. the rate of lactate formation far exceeded any tissue, except the retina. This was a discovery studied by “Pasteur” 60 years earlier (facultative aerobes), which he called the Pasteur effect. Hematopoietic cells of bone marrow develop aerobic glycolysis when exposed to a low oxygen condition. the consumption of one molecule of oxygen generates two molecules of lactate, but in aerobic glycolysis, the relationship disappears. He expressed the effectiveness of respiration by the ‘Meyerhoff quotient’. The role of the allosteric enzyme phosphofructokinase (PFK) not then known, would tie together the glycolytic and gluconeogenic pathways. sever the link and turn on aerobic glycolysis. The explanation for this was provided years later by the work fleshed out by Lynen, Bucher, Lowry, Racker, and Sols. 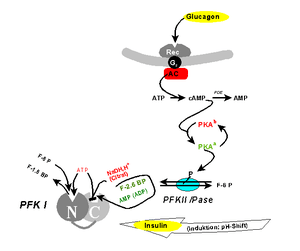 The rate-limiting enzyme, PFK is regulated by the concentrations of ATP, ADP, and inorganic phosphate. The ethylcarbylamide was an ‘uncoupler’ of oxidative phosphorylation. it is a re-orientation of normal cell expression. this provides the basis for the inference that neoplastic cells become more like each other than their cell of origin. re-exposure to higher oxygen did not cause reversion back to normal cells. Warburg publically expressed the rejected view in 1954 (at age 83) that restriction of chemical wastes, food additives, and air pollution would substantially reduce cancer rates. His emphasis on the impairment of respiration was inadequate. the prevailing view today is loss of controlled growth of normal cells in cancer cells. 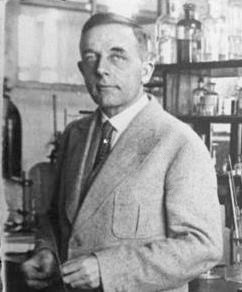 Otto Warburg: Cell Physiologist, Biochemist, and Eccentric. Hans Krebs, in collaboration with Roswitha Schmid. Clarendon Press, Oxford. 1991.ISBN 0-19-858171-8. The Human Genome Project, driven by Francis Collins at NIH, and by Craig Venter at the Institute for Genome Research (TIGR) had parallel projects to map the human chromosome, completed in 2003. It originally aimed to map the nucleotides contained in a human haploid reference genome (more than three billion). TIGR was the first complete genomic sequencing of a free living organism, Haemophilus influenzae, in 1995. This used a shotgun sequencing technique pioneered earlier, but which had never been used for a whole bacterium. the sequence alignment program MUMmer. 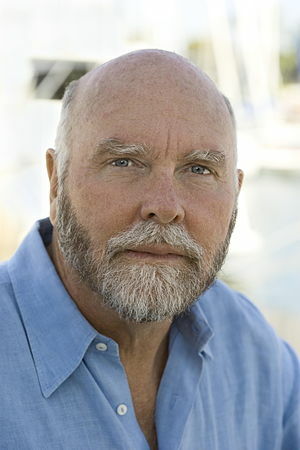 In 2002, Venter created and personally funded the J. Craig Venter Institute (JCVI) Joint Technology Center (JTC), which specialized in high throughput sequencing. The JTC, in the top ranks of scientific institutions worldwide, sequenced nearly 100 million base pairs of DNA per day for its affiliated institutions (JCVI) . He received his his Ph.D. degree in physiology and pharmacology from the University of California, San Diego in 1975 under biochemist Nathan O. Kaplan. A full professor at the State University of New York at Buffalo, he joined the National Institutes of Health in 1984. There he learned of a technique for rapidly identifying all of the mRNAs present in a cell and began to use it to identify human brain genes. The short cDNA sequence fragments discovered by this method are called expressed sequence tags (ESTs), a name coined by Anthony Kerlavage at TIGR. Venter believed that shotgun sequencing was the fastest and most effective way to get useful human genome data. There was a belief that shotgun sequencing was less accurate than the clone-by-clone method chosen by the HGP, but the technique became widely accepted by the scientific community and is still the de facto standard used today. Shreeve, James (2004). The Genome War: How Craig Venter Tried to Capture the Code of Life and Save the World. Knopf. ISBN 0375406298. Sulston, John (2002). The Common Thread: A Story of Science, Politics, Ethics and the Human Genome. Joseph Henry Press. ISBN 0309084091. “The Human Genome Project Race”. Center for Biomolecular Science & Engineering, UC Santa Cruz. Retrieved 20 March 2012. Venter, J. Craig (2007). A Life Decoded: My Genome: My Life. Viking Adult. ISBN 0670063584. In ovarian cancer, the FR-α appears to constitute a good target because it is overexpressed in 90–95% of malignant tumors, especially serous carcinomas. Targeting ligand, folate, is attractive as it is nontoxic, inexpensive and relatively easily conjugated to a fluorescent dye to create a tumor-specific fluorescent contrast agent. While this does invoke possibilities for prognosis, the decision to perform the surgery, whether laparoscopic or open, is late in the discovery process. However, it does suggest the possibility that the discovery and the treatment might be combined if the biomarker itself had the fluorescence to identify the overexpression, but it also is combined with a tag to block the overexpession. This hypothetical possibility is now expressed below. Dr. Aviva Lev-Ari reports that a new technique developed at MIT Broad Institute and the Rockefeller University can edit DNA in precise locations taken from Science News titled “Editing Genome With High Precision: New Method to Insert Multiple Genes in Specific Locations, Delete Defective Genes”. According to Feng Zhang, this is an improvement beyond splicing the gene in specific locations and insertion of complexes difficult to assemble known as transcription activator-like effector nucleases (TALENs). a nuclease called Cas9 bound to short RNA sequences. when they encounter a match, Cas9 cuts the DNA. if there is a single base-pair difference between the RNA targeting sequence and the genome sequence, Cas9 is not activated. In its first iteration, it appears comparable in efficiency to what zinc finger nucleases and TALENs have to offer. The research team has deposited the necessary genetic components with a nonprofit called Addgene, and they have also created a website with tips and tools for using this new technique. The above story is reprinted from materials provided by Massachusetts Institute of Technology. The original article was written by Anne Trafton. Le Cong, F. Ann Ran, David Cox, Shuailiang Lin, Robert Barretto, Naomi Habib, Patrick D. Hsu, Xuebing Wu, Wenyan Jiang, Luciano Marraffini, and Feng Zhang. Multiplex Genome Engineering Using CRISPR/Cas Systems. Science, 3 January 2013 DOI: 10.1126/science.1231143. http://Science.com. Editing genome with high precision: New method to insert multiple genes in specific locations, delete defective genes. ScienceDaily. Retrieved January 20, 2013, from http://www.sciencedaily.com­ /releases/2013/01/130103143205.htm?goback=%2Egde_4346921_member_205356312. These researchers have discovered a new mechanism by which breast cancer cells switch on their aggressive cancerous behavior. The discovery provides a valuable marker for the early diagnosis and follow-up treatment of malignant growths. The information needed for the production of a mature protein is encoded in segments called exons . the exons are joined together. Alternative splicing is when a specific ”scene” (or exon) is either inserted or deleted from the movie (mRNA), thus changing its meaning. the resulting changes in the proteins encoded by these different mRNAs are required for normal function. ”bad” protein forms are generated that aid cancer cell proliferation and survival. a protein involved in the transmission of information into the cell. The application to biotherapeutics would be to ”reverse” the alternative splicing of S6K1 in cancer cells back to the normal situation as a novel anti-cancer therapy. A*STAR Scientists Pinpoint Genetic Changes that Spell Cancer: Fruit flies light the way for scientists to uncover genetic changes. versus those with limited impact on cancer progression. This study published in the prestigious journal Genes & Development could pave the way to design more targeted treatment against different cancer types, based on the specific cancer-linked mutations present in the patient, an advance in the development of personalized medicine. Signaling pathways involved in tumour formation are conserved from fruit flies to humans. In fact, about 75 percent of known human disease genes have a recognizable match in the genome of fruit flies. Leveraging on their genetic similarities, Dr Hector Herranz, a post-doctorate from the Dr. Stephen Cohen’s team developed an innovative strategy to genetically screen the whole fly genome for “cooperating” cancer genes. These genes appear to have little or no impact on cancer. a genetic change commonly associated with breast and lung cancers in humans. SOCS5 (reported in this paper) is one of the several new “cooperating” cancer genes to be identified. The IMCB team is preparing to explore the use of SOCS5 as a biomarker in diagnosis for cancer. ‘Altered cellular metabolism is a hallmark of cancer,’ says Dr Patrick Pollard, in the Nuffield Department of Clinical Medicine at Oxford. Most cancer cells get the energy they need predominantly through a high rate of glycolysis, allowing cancer cells deal with the low oxygen levels that tend to be present in a tumour. But whether dysfunctional metabolism causes cancer, as Warburg believed, or is something that happens afterwards is a different question. In the meantime, gene studies rapidly progressed and indicated that genetic changes occur in cancer. Alternatively the cell might shut down or be killed off (apoptosis) before any damage is caused. However, the repair machinery is not perfect. DNA changes can begin to accumulate as the cell becomes cancerous. He is now collaborating with Professor Tomoyoshi Soga’s large lab at Keio University in Japan, which has been at the forefront of developing the technology for metabolomics research over the past couple of decades. enables them to probe the metabolic changes that occur in cancer. dysfunctional cell metabolism is important in cancer. changes in the function of a metabolic enzyme have been implicated in the development of gliomas. These results have led to the idea that some metabolic compounds, or metabolites, when they accumulate in cells, can cause changes to metabolic processes and set cells off on a path towards cancer. Patrick Pollard and colleagues have now published a perspective article in the journal Frontiers in Molecular and Cellular Oncology that proposes fumarate as such an ‘oncometabolite’. Fumarate is a standard compound involved in cellular metabolism. accumulation of fumarate when an enzyme goes wrong affects various biological pathways in the cell. It shifts the balance of metabolic processes and disrupts the cell in ways that could favour development of cancer. Patrick and colleagues write in their latest article that the shift in focus of cancer research to include cancer cell metabolism ‘has highlighted how woefully ignorant we are about the complexities and interrelationships of cellular metabolic pathways’. uncovered widespread promoter-centered intragenic, extragenic, and intergenic interactions. proximal and distal genes were engaged through promoter-promoter interactions. some interacting promoters could influence each other implying combinatorial complexity of transcriptional controls. and suggested significant enrichment of enhancer-promoter interactions for cell-specific functions. genetically-identified disease-associated noncoding elements were spatially engaged with corresponding genes through long-range interactions. cell-specific genes in human cells. New Nucleoporin: Regulator of Transcriptional Repression and Beyond. Transcriptional regulation is a complex process that requires the integrated action of many multi-protein complexes. The way in which a living cell coordinates the action of these complexes in time and space is still poorly understood. nuclear pores, well known for their role in 3′ processing and export of transcripts, also participate in the control of transcriptional initiation. nuclear pores interface with the well-described machinery that regulates initiation. specific nucleoporins are required for binding of the repressor protein Mig1 to its site in target promoters. Nuclear pores are involved in repressing, as well as activating, transcription. Here we discuss in detail the main models explaining our result and consider what each implies about the roles that nuclear pores play in the regulation of gene expression. Prediction of Breast Cancer Metastasis by Gene Expression Profiles: A Comparison of Metagenes and Single Genes. genes can be grouped together as metagenes (MGs) based on common characteristics such as pathways, regulation, or genomic location. To test the significance of the performance difference between MG- and SG-features/classifiers, we used a repeated down-sampled binomial test approach. classifiers had a poorer performance when validated in strictly independent datasets. no significant performance difference was found when validation was performed between different platforms. Prediction of metastasis outcome in lymph node–negative patients by MG- and SG-classifiers showed that SG-classifiers performed significantly better than MG-classifiers when validated in independent data based on the same microarray platform as used for developing the classifier. However, the MG- and SG-classifiers had similar performance when conducting classifier validation in independent data based on a different microarray platform. The latter was also true when only validating sets of MG- and SG-features in independent datasets, both between and within similar and different platforms. M Beta, A Venkatesan, M Vasudevan, U Vetrivel, et al. Identification and Insilico Analysis of Retinoblastoma Serum microRNA Profile and Gene Targets Towards Prediction of Novel Serum Biomarkers. to study the expression of a few of the identified oncogenic miRNAs in the advanced stage primary RB patient’s serum sample. 24 downregulated (fold change > 2.0, P < 0.05). 33 miRNAs had followed a similar deregulation pattern in RB serum. Later we validated a few of the miRNAs (miRNA 17-92) identified by microarray in the RB patient serum samples (n = 20) by using qRT-PCR. exploring the potential of serum miRNAs identification as noninvasive diagnosis. involved in RB progression were identified in the gene expression profile of RB tumors. potential biomarkers and key events involved in the RB pathway. Computational Design of Targeted Inhibitors of Polo-Like Kinase 1 ( lk1). (KS Jani and DS Dalafave) Bioinformatics and Biology Insights 2012:6 23–31.doi: 10.4137/BBI.S8971. Computational design of small molecule putative inhibitors of Polo-like kinase 1 (Plk1) is presented. Plk1, which regulates the cell cycle, is often over expressed in cancers. Down regulation of Plk1 has been shown to inhibit tumor progression. Most kinase inhibitors interact with the ATP binding site on Plk1, which is highly conserved. This makes the development of Plk1-specific inhibitors challenging, since different kinases have similar ATP sites. However, Plk1 also contains a unique region called the polo-box domain (PBD), which is absent from other kinases. the PBD site was used as a target for designed Plk1 putative inhibitors. Common structural features of several experimentally known Plk1 ligands were first identified. The findings were used to design small molecules that specifically bonded Plk1. Drug likeness and possible toxicities of the molecules were investigated. Molecules with no implied toxicities and optimal drug likeness values were used for docking studies. Several molecules were identified that made stable complexes only with Plk1 and LYN kinases, but not with other kinases. One molecule was found to bind exclusively the PBD site of Plk1. Possible utilization of the designed molecules in drugs against cancers with over expressed Plk1 is discussed. The previous discussions reviewed the status of an evolving personalized medicine multicentered and worldwide enterprise. It is also clear from these reports that the search for targeted drugs matched to a cancer profile or signature has identified several approaches that show great promise. We know considerably more about metabolic pathways and linked changes in transcription that occur in neoplastic development. We have probes to genetic links to the control of many and interacting signaling pathways. We know more about transcription through mRNA. We are closer to the possibility that metabolic substrates, like ‘fumarate’ (a key intermediate in the TCA cycle), may provide a means to reverse regulate the neoplastic cells. We may also find metabolic channels that drive the cells from proliferation to apoptosis or normal activity. This discussion identified the huge expansion of genomic technology in the investigation of biopharmacotherapeutic targets that have been identified involving different levels and interacting signaling pathways. There are several methods of analyzing gene expression, and a primary emphasis is given to combinations of mutations expressed in different cancer types. There is a major hypothesis that expresses the need to focus on “central” “driver mutations” that correspond with the regulation of gene expression, cell proliferation, and cell metabolism. What hasn’t been know is why drug resistance develops and whether the cellular migration and aerobic glycolysis can be redirected after cell metastasis occurs.